We had a birth in the family recently—my nephew Justin and his wife Lissa had a healthy baby boy, whom they named Bryce. It got me to thinking about the concept of the Big Payoff. The Big Payoff is central to the American dream. In Westerns, it’s claiming that ten-thousand-acre spread where Ma and Pa can raise the young-uns. In gangster flicks, it’s the last big job that the criminal pulls, when he takes down the U.S. Mint. For the Vegas gambler, the big payoff is the jackpot. For you and me, it might be the dream job, the fantasy spouse, the smash hit that puts us over the top. The dream of the Big Payoff is that it will change our lives. I’ve succumbed to this dream. Have you? First, the payoff is never big enough. By the time you’ve paid taxes and commissions, weathered the jealousy of your colleagues, and written the final alimony check, you’re left with barely enough for a caramel machiatto. Second, Big Payoff #1 elevates you to Level #2, on which the challenges are even greater and the drop into the abyss even scarier. Third, a real Big Payoff carries with it a carload of perverse karma. How often does an outcome we think is great turn out to be the worst thing that ever happened to us? That girl, that house, that Oscar. Nine months later we’re checking into rehab. Ernest Borgnine in "The Wild Bunch"
I’d like to make one good score and back off. The truth is there is no Big Payoff. No matter what crown they put on your head, you wake up tomorrow morning facing the same Resistance and hearing the same Muse’s call. You’re still you. Your destiny may have changed, but you’ve still gotta fulfill it, and no one and nothing can help you. 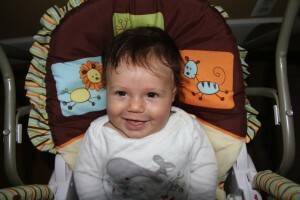 Which brings me back to young Bryce, who just turned three months old. How does he experience his life? It must feel pretty good, having two adults spend their every waking second loving you and taking care of your needs. Maybe we all remember that. Maybe that’s the Big Payoff we dream about. But not even Bryce himself can go back to that. Right now he’s trying like mad to roll onto his tummy and crawl. Once he does, there’ll be no looking back. Me, I keep coming back to the idea of “having a practice.” A practice is lifelong. A practice promises no nirvana. The whole point of a practice is that we discover meaning (and define ourselves) in the act of struggle and the expression of aspiration. It will help us, I believe, to let go of the dream of a Big Payoff. We’re humans. We can’t go back to the Garden. Like Bryce, all we can do is keep crawling forward, paying attention as we go. It’s not only the “American Dream” based on (big) pay off, but -I believe- the way with think as humans and the way we live. We want meaning in our lives. We NEED meaning in our lives. We love to believe that if we do our best, we will have our reward. That nothing is based on pure luck. And the weird thing is we are not exactly sure what that reward might be! Well, to tell the truth, the (big) pay-off concept does help when we try to improve ourselves and reach new limits on our skills, but later on we just have to see that this belief is turning into an illusion (or worse: obsession). So then we just have to keep trying our best leaving the pay-off out of the equation, for the only reason that we like doing what we are up to. I might say that we shouldn’t believe in pay offs, but still: we all are raised with this concept. To tell the truth I just realized that I see a pay-off by reading the article above. I can’t think of a bigger pay-off than be able to live by the thing you love the most, also to communicate with other “colleagues” and share thoughts, problems, triumphs of the creating process with people that they understand what you are saying. P.S. I didn’t know about Ernest Borgnine. He was great! But I believe he was the Greaterest (!?) acting the Roman soldier on Jesus of Nazareth of Franco Jeffirelli. I used to watch the golf show The Big Break–loved it. What I never understood though, is it didn’t seem like a big break because the people would still be doing what they loved (golf), even if they lost. I always thought they should’ve cherished the fact that they were able to play golf, pursue their passion full-time, in spite of having no money and no big pay-days. The Big Break came to them when they made the decision to dedicate themselves. Love it! that’s why the work has to be the reward. The day to day of practice is everything. Musicians know that the only ones who do well are the ones who actually enjoy practicing the instrument. If practice is a discipline to obtain a payoff you never get good enough to get a payoff. If everything is practice including the next payoff the evolution continues and there is joy in all the steps. absolutely. The American culture can be dangerously oversimplified into black and white, success and failure. I know as a child I dreamed of my big break, having instant success, fame, and wealth. Old habits die hard, and I still dream of it, even as I have grown to accept the more complex reality of slowly crawling forward. And, honestly, it’s a good thing. If the giddy heights of success are dampened, so too are the lows of failures. You just keep moving and try not to label yourself. I’m 27, and I’ve been writing week to week, day to day, since high school, and I’m beginning to feel I’m a failure as I haven’t been published, or have yet to finish my novel. But I fight that feeling–it’s all part of Resistance’s game–and learn from the people who have gone ahead of me. It’s taken me a decade to get my mind straight, but slow or not, I’m moving forward. Thanks for all the advice and encouragement, it helps move me forward. Thinking about it now, I associated practice with “achieving external goals.” Here’s an example: In basketball practice, I practiced my free throws, not for the sake of the free throw itself, but for the external goal of making sure I could hit the shot during an actual game. That’s one way to take the fun out of practice! Now, with your words, Steven, I can practice my art – I can practice LIVING! – the right way…the human way. It’s not that we are “going to be great” or even “use to be great.” It is, quite simply, “being great. The storm has disappeared. The clouds have parted. I see the light. Recently watched the documentary on Kevin Clash, “Being Elmo”. This guy has had the big break and it doesn’t seem to matter to him. He loves what he does and has relentlessly pursued the craft of puppetry inside and out since he was a kid. It is his world and he does it regardless of the payoff. May we all have the joy of work for it’s own sake. Congratulations on the new arrival. It seems like a long time since there was a baby in our house. My daughter turned 10 years old yesterday. This is a great post. I’m coming to the end of a first draft at the moment and although I enjoy writing, the resistance is always there in some form. I know that it’ll still be there with the next novel too and everything else I write. It is definitely an ongoing process rather than a race to a finishing line. Thank you for sharing. By the way, I blogged about Turning Pro yesterday because I found it a very helpful, insightful read. Thank you. This is the 3rd or 4th time your posts have been exactly what I needed to hear…karma, G-d’s will, the Spirit hovering, the corrective Muse…whatever you want to call it. I’m just about to release my second book (a memoir) and my wife asked me last night if I was excited. I said-why no one will read it. I was already disappointed knowing the ‘big payoff’ wouldn’t come. Maybe I was trying to trick fate with reverse pyschology but you reminded me that my job is to write it—work my practice. Thanks again! I find alot of creative people get hung up in the “If I could only” thinking. They procrastinate with it by daydreaming how wonderful everything would be, uusually meaning “I won’t have to do this particular thing anymore”. I get asked several times a month by other artists “How do you manage to sell 100 ltd. edition prints at a time? !” or more often, “How can I sell 100 prints?”. The answer – and frankly it’s gotten to be a little glib on my part – is “There’re very few ways to sell 100 prints, but I can show 100 ways to sell ONE print”. Wonderful post. What comes to mind is the film “84 Charring Cross Road.” Ann Bancroft’s character, Helene, was a struggling writer and passionate bibliophile who just kept her writing practice going and going and going, because she had to. It’s not only a unique and complex love story, but Helene’s life as a writer is really about Doing The Work. Today I find that family and friends want to know why we are doing all this “writing” work, when we could be doing so much less and having more fun. I think they must mean their definition of fun. And often others see “purpose” in the writing life only if certain acknowledgement is given – another Payoff. For me, writing is my third career,and even though the right agent hasn’t yet fallen in love with my first novel, I’m working on my second one, writing and publishing some short stories, developing my blog, and teaching some of what I have learned. Maybe I’m already experiencing The Payoff. Steven Pressfield! You the man. I just found you via your book, The War of Art. Doesn’t it count as a payoff for you that you touch your readers so deeply & profoundly? Because you do. I’m a fan for life.